It’s not a typical situation for someone with a medical degree and her own sanitarium, but Julia’s currently on vacation in a parallel dimension, solving other people’s problems. She’s murdered her alt-universe double — Collinwood’s housekeeper, Hoffman — and taken her place, in order to revive a black-magic-afflicted coma victim and destroy a wicked witch. Now she’s hopping back and forth between making beds and exploring the outer limits of human consciousness, just like every other woman in 1970. She’s a housekeeper, a bartender, an impostor, a spy, a murderer, a blood specialist, a henchperson, a mad scientist, a dear friend and an all-purpose lunatic. I don’t know she does it; it just goes to show that women really can have it all. So this is what’s left, when you’ve killed all your characters and you still can’t go home for another two weeks: three sad people, plus an unconscious woman in the basement and a mysterious pair of feet. Over the last week, we’ve lost two more cast members, whittling Parallel Time’s endless murder mystery down to the minimum viable suspects. If we’re ever going to find out who killed Angelique all those months ago, then we’d better do it soon, while we’ve still got a family to offer cocktails to. Elizabeth’s refusing the adult beverages because she’s worried sick about her daughter Carolyn, whose husband jumped from a high window last week. Carolyn’s spent the last few days drinking her way across the great mansions of the Eastern seaboard, and Liz doesn’t know how to help Carolyn get over her loss. She’s about to learn that she can stop worrying about it; that problem has been decisively solved with a large kitchen knife. 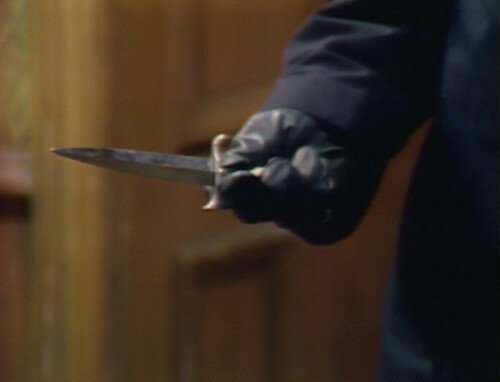 Roger breaks the news that Carolyn’s been murdered in the tower room by their cousin Quentin, who may still be in the house and armed with silverware. “Mrs. Stoddard,” Julia says, “would you care for a brandy? 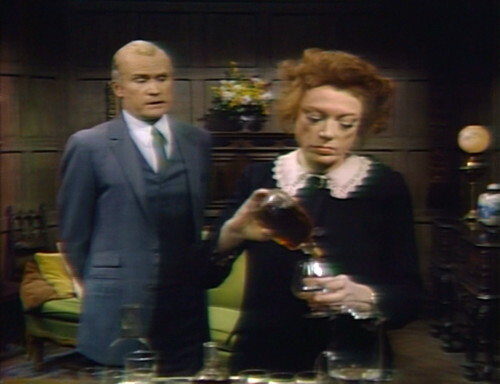 It might help.” It’s not super clear how a brandy would help, but when Julia’s in housekeeper drag, she’s not allowed to give people sedatives, and she doesn’t know what else to do. She tries Roger, but he’s not buying either. “No, thanks,” he says. “It doesn’t seem the moment, somehow. I’ve been accused of drinking to escape reality. Well, perhaps reality has caught up with me this time. I think a brandy would be pointless.” Okay, Julia thinks. You could’ve just said no thanks. “If only I’d gotten there a moment or two earlier!” Roger moans, as his sister collapses into sobs. “What was she doing in the tower, why was she there?” Why were YOU there? somebody doesn’t say, because we’re not solving the mystery this week. “Poor Carolyn,” he continues. “She’s with Will now, I must think of that.” That’s not entirely true, because Carolyn was in the tower room and Will’s spread over a substantial percentage of the back patio, but you know what he means. “It’s all of our fault, really!” he says, generously. “We’ve gone on living in this house, half suspecting that Quentin was here, ignoring all of the signs that pointed to more violence.” Then they just keep sitting on the couch. Elizabeth goes to spend a little time in a room that doesn’t include someone pointing out whose fault everything is, and Roger sighs, “The sum total of my life seems to be that I can never help anyone.” Then he decides that he will have that brandy after all. While Julia pours, he asks if she thinks Quentin is still in the house, but he’s just killing time until the drink arrives. He clutches at it with both hands. “I need this,” he explains. “Oh, how I need it.” Then he drains it in one gulp. Dude needs to figure out his bar orders in advance. 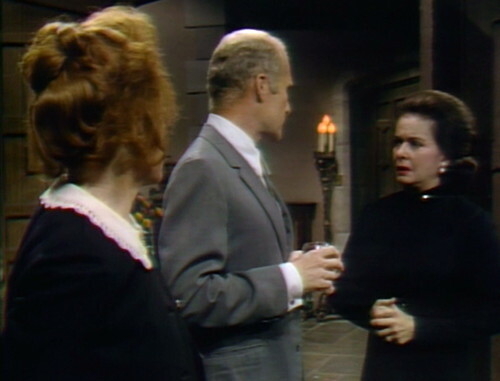 Liz pops back in, and says they need to go out to the mausoleum and decide where Carolyn’s going to be buried. The others say that can wait until tomorrow, but Liz insists they have to go now. They’re the only three characters with speaking lines in today’s episode, and if they all stay in the drawing room, then they’ll run out of things to talk about, which they already have. And then it’s off to the mausoleum for some mystery feet! 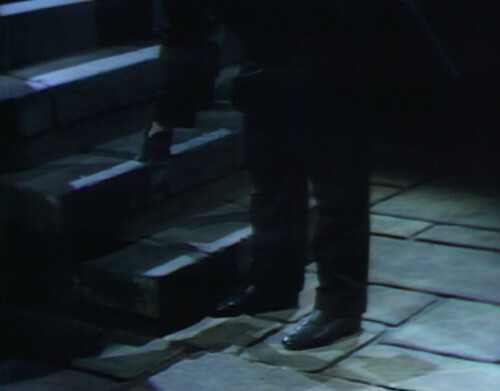 This is common Dark Shadows practice when they don’t feel like paying a guy to show up and eavesdrop on people; they get a stand-in to do the feet, and we have to imagine the rest of him. This is the enigmatic Claude North, who’s been living in the secret room in the mausoleum for who knows how long, drinking milk and drawing on his sketchpad. He’s apparently come back to pick up his dagger, possibly en route to the dairy for a refill. Luckily, Claude shuts the secret panel before Liz and Roger walk in, and proceed to have a conversation that should reassure Claude that he’s made the right choices in his living arrangements. There are worse things than huddling in a dank stone room by yourself, and here come two of them. Their conversation, which is entirely baffling, is presented here in full. Roger: Elizabeth, I understand your grief, but this is not right! Liz: I had to come here, Roger. Roger: Elizabeth, why have we come here? Liz: I don’t want Carolyn buried next to Angelique. You can understand that, can’t you? Roger: Yes. She should be buried in the cemetery, with her husband. Liz: No. She’s a Collins. She belongs here. Her ancestors are buried here. Roger: Well, I’m certainly not going to argue with you. If it’s settled, let’s go back to Collinwood. Liz: We have other things to do! Roger: In heaven’s name, what? Liz: If you don’t want to do them with me, Roger, I will do them alone! Liz: You will, Roger. You will. I’m not sure about that, because I for one don’t understand what you’ve accomplished so far. Liz doesn’t want Carolyn buried next to Angelique, who’s here in the mausoleum, but then she says Carolyn should be buried in the mausoleum, because her ancestors are here. So how does that help with the Angelique proximity problem? Also, why did you have to come all the way out to the mausoleum to spend forty seconds not making the decision that you just didn’t make? 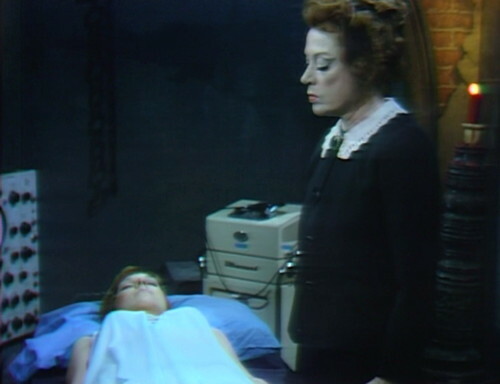 Meanwhile, Julia’s in the Old House basement with Roxanne, the fountain of life force who’s keeping Angelique alive. Julia’s got science machines scattered around the room, with a big Frankenstein wall switch and things that go zap, and she gives us a handful of incoherent exposition. So she starts plugging extension cords into the girl’s scalp, being extra careful not to go too far. Then they do two minutes of electrified metal machine music with a commercial break in the middle, to no avail. Roxanne is not interested. 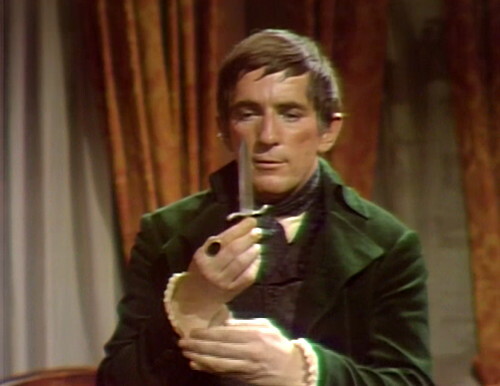 So this is what Dark Shadows is like these days, just feet and knives and under-motivated mad science. The characters drift from one scene to another, changing their minds and unmaking decisions, and being careful not to wake each other up. It’s kind of peaceful, in a way, if you like that kind of thing. Monday: PTED: Destroyer of Worlds. 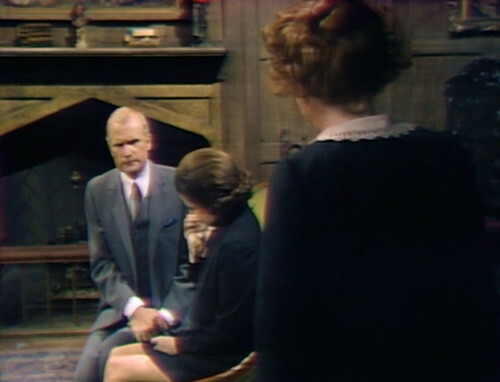 When Julia opens the drawing room doors to find Liz and Roger on the couch, the boom mic is clearly visible. 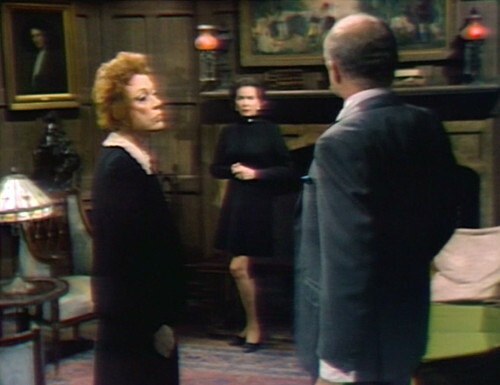 Julia says that she’s enjoying Alexis’ visit, and Roger says, “Does — are you?” At the same moment, we can see Liz outside the drawing room, waiting for her cue to enter. When Claude enters the secret room in the mausoleum, there are electrical cables on the floor. Alex Stevens is the stand-in for Claude North today, as we follow his legs and gloves and dagger around town. 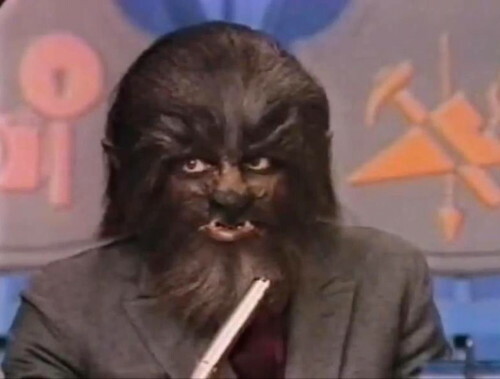 Stevens is better known in Dark Shadows circles as the stunt man who played the werewolf — both the Chris version and the Quentin version — in 23 episodes, starting in December 1968. He also played Janet Findley falling down the stairs in one episode. This is his last episode on the show. After Dark Shadows, Stevens had a long and productive career as a stunt man in a ton of movies, including Night of Dark Shadows, The French Connection, Super Fly, The Eyes of Laura Mars, Superman, Scanners, The Four Seasons, Splash, 3 Men and a Baby, King of New York, and Goodfellas, plus an episode of jailhouse drama Oz and three episodes of Ryan’s Hope. He was phenomenal, and I will miss him terribly. Roger draining a brandy glass in one gulp? Yep, that’s definitely not our Roger of real and present time, who, no matter the level of stress he was under, would always pour himself just a sliver of spirits and in a show of cocktail elegance tilt his head back for a big theatrical sip, but still leave a little remaining at the bottom of the glass. The way PT Roger does it is more like RT Sam Evans, who would take a tall glass of whiskey three quarters full and swill it down all at once like it was orange juice. Maybe PT Sam Evans was the more elegant drinker instead. How are they going to be able to fit another coffin in the mausoleum, when they’ve already got the same three in there as from the RT mausoleum? Are they going to just begin stacking them like bunk beds? Joshua Collins, whether in RT or PT, with a family of four, only had the foresight to build a mausoleum big enough for just three. Joshua most likely figured that Barnabas and Sarah would be buried with their future spouses. My guess is that the third sarcophagus was originally meant for Abigail. I thought there were spaces in the wall for more coffins. She’s gotta lotta life force, that gal. You’ve come a long way, baby – all the way to a parallel universe! there is no excuse for her obvious lapse in personal grooming. What is up with that hair? Has she subscribed to the adage that “Either the house looks good, or I do, you don’t get both”? It looks like she did her coiffure with a parallel pigweasel’s patootie! I can cut her some slack, busy day and all, but Angelique is sure to spot the deception, with “Hoffman” looking like such a drudge. Well in all fairness, that ain’t a house – that’s a hotel. Give Julia a break – she’s not used to vacuuming one rug, much less 101 rugs. My bet is, she’s over there shaking up a cocktail for herself. That’s how Mrs. Johnson got through the day! Yeah, I know – if I suddenly dropped through a space-time vortex and murdered my parallel self, I’d be a little leery about using “his” stuff. Even though “he” is me, I would definitely go out and get a new toothbrush, razor, and comb. And maybe underwear, too. Don’t forget nose hair clippers. NOBODY should have to use Hoffman’s nose hair clippers. Sorry. I can’t explain it but, that’s what popped into my head when I thought of Hoffman. I’m sure that the always-prepared Dr. Hoffman keeps her own in her purse, thank you…right next to the sedatives bin. Who knows WHERE I’ve been. And yet, somehow I still keep meeting myself on the way back. Let’s be fair. Julia is dealing with electricity these days and it seems to be giving here hair extra poofiness. And she has a lot on her plate. Still, give her credit for learning the drinking habits of PT Collins family:”Are you sure, Mrs. Stoddard? You usually like a cocktail before dinner.” Also she created a lab complete with Frankenstein electric switches. It’s her new shampoo, “Gee, Your Hair Smells Ionized”. It was very convenient for Barnabas and Julia that PT used the same currency as RT. Imagine them getting out their wallet, and being asked what that funny green paper was? And why was that traitor to the crown, Jefferson, in it? The more one thinks of it, the more Barnabas and Julia’s myopia in PT is puzzling. They never even muse on the differences between the two time bands. I hope Danny will muse on this before we leave PT. In other news, does Roxanne have honeydew melons in her nightie? not with the hooters she’s already got in there. Parallel hot rollers don’t work the same way. They just don’t. Besides, she just got hit with the old “It’s Not You, It’s Me, And All These Nubile Chicks In Diaphanous Gowns” routine. It sure is an old routine. Real old. 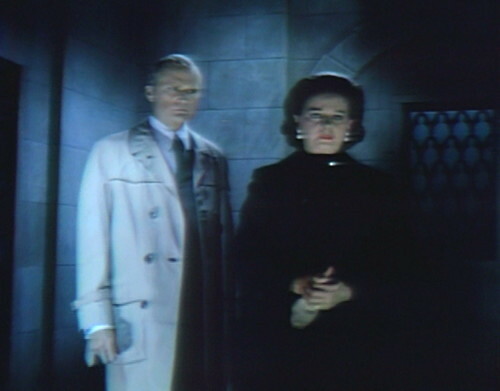 I do wish Julia would hook up with Prof. Stokes and leave Barnabas to the dead and half dead daiaphanously gowned chicks he obviously prefers. That was my hope, that Julia and Stokes would get together. They were both intelligent and he wasn’t always going after any young, pretty woman that crossed his path. Plus they had a nice easy chemistry as Magda and Sandor, so the couple did work. Heck yeah. Eliot is a far better match for Julia than ol’ Gloom & Doom. Eliot has an insatiable intellectual curiosity – jus tlike Julia. And unlike Barnabas, he’s capable of talking about something besides his own needs for five minutes. Plus, he’s good lookin’, has a sense of humor and I bet he’d be a great dancer. Julia would have FUN with Stokes. She could still use Barnabas as a science project – she and Eliot could write the Barnabas paper together. And all the sharp cheese and unsweetened biscuits a girl could ever want! Agreed. He should grow a goatee though, just to add a little edge. I don’t think that would be a good match, given how Julia has been keeping secrets from T.E. Stokes all along and who only seems to need him when she finds it convenient to use his help to get her out of a bind. Quite simply, she takes him for granted. Alas, Barnabas is the one she truly confides in, her only friend in the world. When she agreed to step into the confined and secretive vortex that is Barnabas’ domain, it was at the exclusion of everyone else, that is, those who live in the real world. Because she must keep and protect Barnabas’ secret, she can never again in her life have another true confidant. No doubt about it; it’s damned hard to have any kind of close relationships outside of Murder Club. I think that’s how Julia and Chris got so close so fast. Not that the show would ever have let a friendship between an older woman and younger man turn romantic, TV Gods forbid! But if they had, we know from the Tom/Julia vampire scenes that the actors could have sold it. Hmm. That’s how I perceived the Laura Collins-Dirk Wilkins relationship. Yeah, I guess Julia is way too far gone to participate in a normal relationship at this point. We don’t know what she was like before but, her morals have been pretty lax since she became Barnabas’ thrall. 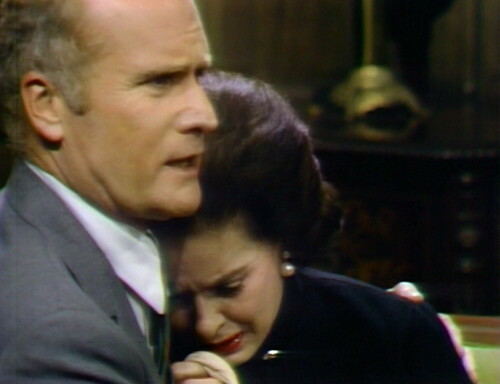 Stokes wouldn’t have gone along with a fraction of the crap Julia has pulled to protect Barnabas – no way would he have stood for them killing Dave Woodard, for instance! Not for the sake of science or medicine or Julia’s career or Barnabas’ diaphanous skirt chasing ego. Still – spending some quality time with Eliot would have been a nice change for Julia, every now and then. He certainly was intellectually stimulating. And he had a pulse. It’s entirely possible I imagined it or read too much into it, but I always thought there was a bit of a spark between Julia and the Robert Gerringer version of Dr. Woodard, he of the cute rear end. Like, maybe they dated a little when they were in school together. Or maybe there was an old attraction, even if they never acted on it. But not in the Larry Chase sense. Speaking of, why didn’t they make him “Peter Guthrie”? He looked enough like him. Could have been another fun little extra PT thingie. Sandor & Magda were the happiest couple of the entire series! One of “The Signs You’re In A Toxic Relationship”. Julia should write a book – The Barnabas Collins I Know. There’s a typewriter and a lot of paper there at the Loomis house that’s just going to go to waste.